Plantronics APU-75 CS500 Series (CS510, CS520, CS530, CS540, C054, C052) to PC/USB Adapter for users who wants to use with PC/Computer softphone (like Microsoft Skype for Business). It turns your CS500 series wireless headset into a USB wireless headset. 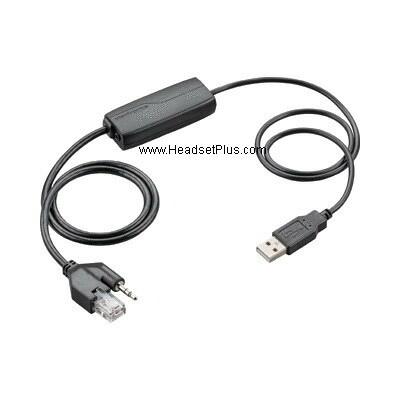 Simply plug this APU-75 cable into the back of the CS500 series headset (like CS540) base, plug the USB end into the PC. Now you can use with your softphone on your PC. Plantronics APU-75 takes the place of the interface cable which connects the wireless headset base. So you cannot switch back and forth from desk phone to softphone. If you need to switch back and forth, we recommend the Plantronics Savi W740 Wireless Headset that allows you go switch between computer softphone and desk phone. Plantroincs APU-75 is also compatible with the Mitel 6867 and Mitel 6869 HID1 desk phone's USB port.